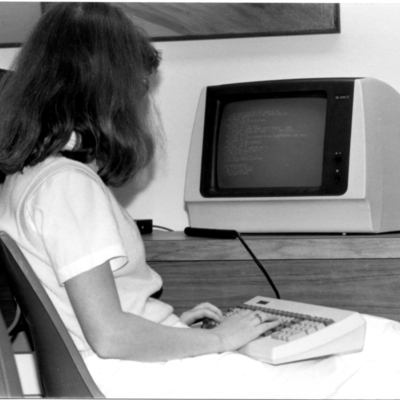 Photograph of a student in the Plan for Alternative General Education (PAGE) program works on a computer in the PAGE student lounge. Original image is 3" X 5" print; black and white. 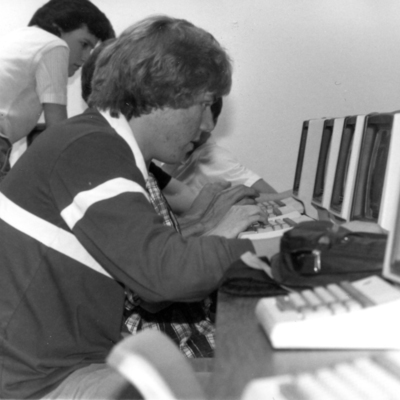 Photograph of students in the Plan for Alternative General Education (PAGE) program working on computers in the PAGE student lounge. Sign in top left reads: "For Page Students Only." Original image is 3" X 5" print; black and white.